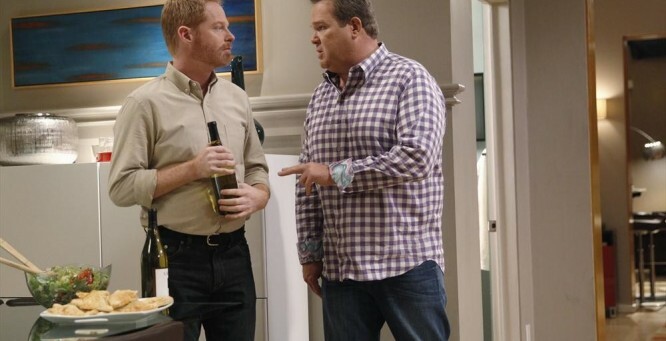 “The Help” was a very strong episode of Modern Family, with the three households each having their own unique stories and hilarious guest appearances in each one aiding the families in their time of need. These three characters include a male nanny, a gay wedding planner and a prostitute. Gloria has a hard time keeping a nanny. Between her wanting to be the star of her household and Manny creeping on the nannies, they never seem to find the right one. That’s when Gloria decides to hire Andy, a male nanny (or, in his words, a “Manny”) who is amazing with kids, a health coach and an amazing chef. Andy is played by comedian Adam Devine, who is hilarious as this super positive, highly energetic, earnest nanny. But Manny and Jay don’t take to another man in the house (Manny is especially upset about another “Manny”). Gloria keeps him anyway. Manny and Jay are really upset and try to fire Andy. When Gloria finds out, she flips out. But when Gloria starts yelling, Andy calms her down, telling her, “The louder we are, the less we’re heard.” Then she calms down and apologizes for yelling. Andy is so awesome with Gloria that Jay changes his mind and hires him on the spot. Cam and Mitch are having a hard time planning their wedding, so they hire Pepper as their event planner. Pepper enters with his Spanish assistant, Ronaldo, and turns their living room into a wedding showroom. But Pepper’s behavior is insulting, and his ideas are way over-the-top. He wants their color to be deep purple, for them to enter the ceremony on a white unicorn and to dress them similar to Willy Wonka. They express that they had something else in mind, and Pepper leaves in a fury, leaving Ronaldo to clean up the makeshift show room. Alone with Ronaldo, they realize Ronaldo has some pretty amazing wedding ideas. Ronaldo suggests casual elegance, with white linen tablecloths. As he talks, Cam and Mitch get really excited; they want to hire Ronaldo, but Ronaldo can’t betray Pepper, and he runs off, saying, “I’ve said too much.” He leaves, and Cam and Mitch plot out how they’re going to get Ronaldo to plan their wedding for them. Later, Ronaldo returns, and says, dramatically, “I couldn’t stop thinking about you. What happened here yesterday was real.” He says he left Pepper because Pepper mistreats him. Ronaldo shows them his ideas for their wedding, and they are blown away. Suddenly, there is a knock at the door. It’s Pepper. Ronaldo hides in the bathroom. Pepper is desperate, revealing that Ronaldo has left him and saying he can’t understand why. Ronaldo appears from the bathroom and tells Pepper that he is thick-headed and never listens to his ideas. Pepper bursts into tears and accuses Cam and Mitch of plotting against him, saying “I’ve planned 53 gay weddings, and never mine.” Ronaldo responds “How can a man with such flare for tables leave no seat for one who loves him?” It turns out Ronaldo is madly in love with Pepper, and they have a sweet moment where they express how they feel about each other and decide to be together. The episode ends with a voiceover by Andy: “Life isn’t easy. Sometimes, we just need a little help. Getting your confidence back, getting on the same page, getting out of your own way.” And with that, another sweet, hilarious, introspective episode of Modern Family has graced television.